Last year, John had a stroke. It was a bad one. For a while nobody was sure when, or whether, John would ever walk again. Let alone ever compete in a pistol match. John was a friend of mine. Not a "close personal friend", in the sense that we went to each other's house for dinner and had helped raise each others' kids. We don't go to the same church, we don't chat on the phone. The fact is, I've never seen John outside of the venue of a match or a gun club activity. That would be ARPC ... the Albany (Oregon) Rifle and Pistol Club, of which John is a past president, and has held other offices as well. But a year ago, and please understand that this is an approximation, I learned that John had been struck down by a killer medical condition. This is the kind of thing which leaves you with one side of your body just ... cut out of your biological circuit diagram. Stroke victims have to work as hard to regain control of their body as hard as amputees have to work to learn to live without a limb. 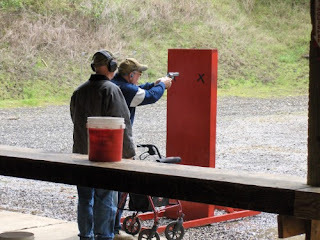 Today, I went to the club to teach an Introduction to USPSA class, and as I was walking along the North Range I saw John. He was at a safety table, threading an ammunition carrier and a holstered revolver onto his belt. He was leaning against a gaudy candy-apple red 'walker', with wheels, and was so engrossed in what he was doing that at first he didn't notice me. "John!" I said. "How are you? Good to see you, Man! How are you feeling?" We chatted for less than a minute, exchanging greetings to each other and to SWMBO (who has been following the story of John's stroke, and has always been eager for the sparse news about his recovery). I went on to take care of my business, and he continued with his. A few minutes later, I was in Bay 3 waiting for the ICORE squad to shoot the first of their five stages. When they cleared the stage, I would have use of that bay for the rest of the afternoon for my class. We were just waiting for the Revolver folks to do their stuff. You know, just hanging around. John was the first shooter on the first stage of the match. It was a simple lateral stage design. Start in Box A, engage a target with six rounds; move to Box B, six rounds on the target. Move to Box C, repeat. Because it was a rainy day, Match Director Mike McCarter had designed all of the 5 match stages so you could move under cover between firing positions to shoot the stages. Thus, everybody was walking on the concrete pad. John's walker could help roll him from one shooting position to the next. It was a slow process, but John didn't seem to be very worried about it. He was here to shoot, and obviously his philosophy was "whatever it takes to get the job done; anything at all". After he finished the stage and was busy stowing his gear in the carry-compartment of his walker, I asked John how it felt. "Oh, you know. I shot pretty slow. But it's always like this for the first stage." Yeah, I know how that is. John's squad finished the stage, cleared the bay, and I started my class. By the time the class was finished John and the ICORE shooters were gone and I didn't find another opportunity to talk with him again. But that's okay. John was back shooting in competition. Maybe he didn't win the match. Okay, probably he didn't win the match. I didn't get the impression that winning was most important consideration for John. What was important was being there. Theordore Sturgeon, a Science Fiction writer, is famously credited for saying "80% of everything is showing up." John was there. He showed up. He did what he had to do, so that he could do what he wanted to do. I've been around the world, and I've "seen the elephant". This was one of the most courageous, most inspiring things I've ever seen. Okay, it was probably not the flashy Alpha Prime kind of heroism and courage which we tend to attribute, for example, combat. It was simply the basic courage of a man who is determined to come back from a hugely traumatic event, and take his life back. "Is it Training, or is it A Game?" Since conflicts are not settled on open ground with dueling pistols and THEIR rules of use any more, learning to "run and gun" is very important for personal survival in any gunfight we might become involved in. These rule-makers are trying, for LEGAL reasons, to introduce safety as the first objective of competition. Unfortunately, under the stress of a gunfight, you will perform as you have trained, and if you have trained under rules which are designed to keep the lawsuit wolf away from the gun club's door, your training will NOT serve you well. If you want to use "run and gun" skills STRICTLY to compete, fine, take the time and effort to become completely at home with the rules. However, if you wish to acquire/sharpen "run and gun" skills for your own survival, you'd be much better off practicing those skills in an un-regulated environment. The BEST way to do that is with a partner or partners who can critique your moves and how you handle your weapon. These partners will introduce safety as a survival issue, and NOT as an end in itself, as the gun clubs must do to stay in business. I disagree with the position taken by the organized "tactical" shooting sports which says that THEIR way is the ONLY way to learn these skills. If the truth be known, THEIR way is the very WORST way to learn these valuable survival skills. In the background of USPSA/IPSC competition, there has always been the question about "what it is". Is it training for "Practical Pistol" purposes (ie: firearms proficiency for the purpose of personal protection) or is it "A Game"? Further background: there have been references to an article in a popular American firearms-related magazine to an article with a title something like: "Practical Pistol: It Will Get You Killed!" As I have explored the boundaries of Practical Pistol (IPSC/USPSA) competition for over five years on this blog, and via copious (and often redundant) dialogue on The Unofficial IPSC List, I've seen this question raised, and addressed, many times. The Unofficial IPSC List is essentially abandoned by now, and we who were its adherents have found other ways to communicate the essentials of our sport. I hope that this blog is one of the viable alternatives. Thus I feel obliged to address the question raised by Rivrdog: will IPSC training, indeed get you killed? What is the purpose of IPSC competition ... Training for self defense, or mere competition? Will the skills (and mind-set) learned in IPSC training get you killed in a self-defense situation? What, then, is the value of IPSC competition, and why should we encourage people to participate? What is the purpose of IPSC competition? The only purpose of IPSC ... and by extension, USPSA competition ... is to learn to shoot competitively, safely, and to measure your skills against others who are similarly equipped and with a similar skill level. Practical competition is only that. We don't want to shoot people, we only want to shoot cardboard and steel targets. When we shoot a match, we are not fulfilling some anachronistic fantasy about "Killing Bad Guys". All we are trying to do is to shoot better, faster, and with greater discrimination in a complex field of targets which we should shoot, targets which we should not shoot ... and do so safely. And have a whale of a lot of fun in the process. I mentioned the complexity of the sport. This not only tests your shooting skills, but also tests your judgment. Can you shoot fast and win, or should you shoot slower and get a higher score to win? Remember, any violation of the safety rules (which include maintaining control of your firearm at all times without potentially endangering other people) will result in the match administrators forbidding any further competition in the match. No, we're not willing to allow 'questionable' tactics during a match. If you can't handle a gun safely, you're out of there! Will IPSC (USPSA) get you killed? The reason for this question is basically that IPSC competition teaches you to shoot without requiring you to perform 'cover' and other movements which would protect you from an opponent that shoots back at you. In this context, the charge is probably true. Defensive tactics are best exemplified by IDPA, which requires the competitor to seek cover before engaging targets. If you want to learn to shoot defensibly, you should take up IDPA rather than IPSC style competition. But we don't much care about that. We're a care-free bunch of folks who only want to shoot at cardboard and steel targets. It's true, we do NOT teach defensive shooting. Rather, we would prefer to stand out in the open (typically) and assume that if we were engaging hostile combatants, we would still persevere by dint of our superior speed and accuracy. Unrealistic? Sure it is. We don't care. We're out for a day of run & gun in the sun, havingt fun. You got a problem with that? Then go shoot IDPA. We're in America -- its a Free Country. Do whatever turns you on. And if want to roll on the ground while shooting, and make tactical magazine changes, that's fine with us. We'll beat your score every day, because all of this rolling on the ground and making tactical magazine changes takes time, and we are all about speed, power and accuracy. So what is the value of IPSC competition? Perhaps the greatest value is that we get to go to the range frequently, shoot at passive targets in a safe environment, and at the end of the day we can see how we stack up against our peer. 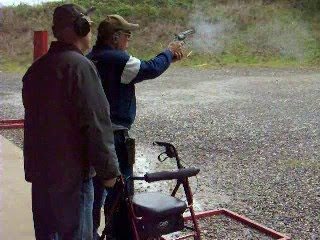 Another benefit is that it absolutely ingrains safe gun-handling habits. Yes, we do emphasize safety first, last and always. But in accomplishing these rote skills, we are learning to ALWAYS be safe with firearms, no matter what the circumstances. The ability to safely handle a firearm provides confidence and confirms a minimal standard of SAFETY in a range situation. No, this does not satisfy RIVRDOG's demand for a Tactical/Defensive posture at tall times and under all circumstances. But then ... that's not the mission of any competitive shooting sport, is it? As well require that any bulls-eye type shooting sport, such as NRA Small-Bore Indoor Rifle ("Gallery Rifle") serve a defensive purpose. It will not happen for Gallery Rifles, and it will not happen for IPSC/USPSA shooting. Ultimately: to chide IPSC/USPSA for not being a training venue for Defensive shooting is as flawed as chiding Gallery Rifle competition for not being a training venue for Defensive shooting. It is not the purpose of the sport. While it may once have been, it is not now and will never be. So I have to tell you, Dog, as much as I respect your LEO experience ... if you choose to denigrate IPSC/USPSA because it doesn't teach and reinforce the proper techniques for close-quarters combat, you're spitting against the wind. That's not what it's all about, and it hasn't been about that for the past decade. CQB for civilians is so ... 20th Century! Shouldn't we maybe all know that Sean Penn is just a little kookie? The video runs a little long, but perhaps the people who are talking ... feel very strongly about the subject. THE...Correct way to arrest a terrorist. I just love the way the police in Spain deals with this guy! If this happened in the USA the cops would all be suspended and fired. The terrorist would get a lawyer, a new motorcycle, $500,000 compensation, an apology from Obama & Holder,and his family would be brought over from Pakistan , and housed on Fifth Avenue . This incident took place in Spain . Apparently the Spanish police agreed to placate a 'bank hostage' situation by allowing the radical to 'escape' uninhibited. He was allowed to walk out of the bank in the company of 2 hostages. The police provided him with a motorcycle and free access to the motorcycle. Then, leaving the hostages behind, he was permitted to ride away down a clear roadway to make his 'escape.' This whole incident, shown on CBS television, complete with news reporting in English, can be seen on this 55-second video clip. The concluding few seconds of this video shows the result of the Spanish planning. Strange, this is the same Spain which bowed to Al Queda terrorists after March 11, 2004, when a train was bombed in Madrid. This occurred 3 days before the general election and was supposedly in opposition to Spanish involvement in the Iraq War. As a consequence, the incumbent party was voted out and all Spanish involvement was discontinued ... as a sop to the Terrorists who had threatened more bombings. It would be nice to interpret this as a new Spanish approach to terrorism. But it probably won't become official international policy until Spain replaces its current dhimmi government.